Today I went to the Olympics. 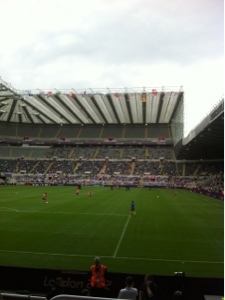 Ok I was in newcastle watching the women's football but it's part of the Olympics so it counts. 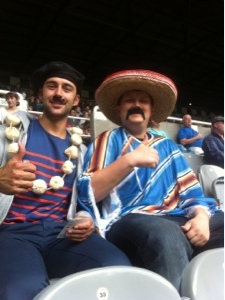 I went to see Canada v Sweden and France v Columbia. I really enjoyed it and it only made me wish I was more successful and had got more of the tickets I'd originally requested. As I got to my seat someone was sat in it, no matter though there were plenty of seats to choose from. 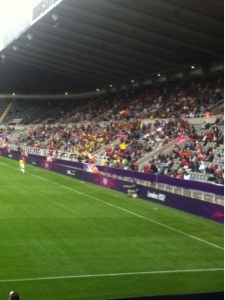 I did feel a bit sad though as the stadium was largely empty, but the British fans of course are always the best at having a laugh and enjoying i, the women's football was quite good and the standard of play was better that I thought it was going to be, Canada in particular impressed me with some great attacking play.